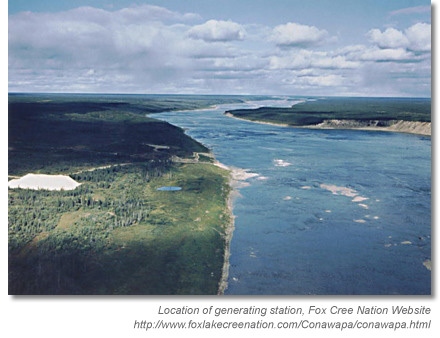 Located 90 km downstream of Gillam on the Nelson River in northern Manitoba, the proposed Conawapa Generating Station aims to be the largest hydroelectric project in Manitoba. The area has already seen the impact of 40 years of hydro development, and outstanding community and environmental concerns at the Fox Lake Cree Nation were finally addressed in a settlement agreement in 2004. The current agreement signed last week proposes to provide funding to Fox Lake, and facilitate their involvement in planning and consultation in project plans, “environmental and regulatory matters, training, employment and business opportunities, and the negotiation of adverse effects arrangements” (1). Elders in the community advise that negotiators remain cautious, and balance economic benefits, community concerns, and previous experience of the Fox Lake Cree Nation (and other First Nations) with Manitoba Hydro. In their press release, Manitobo Hydro recognizes the need for a new and positive relationship, and their commitment to “work together in a new and structured way to cooperatively address issues of mutual interest and concern within the Gillam area.” Agreements have also been reached with the York Factory First Nation, and are proposed for the Tataskweyak Cree Nation and War Lake First Nation.